A glasswasher that offers kitchenware results in a bar washing machine. Utilizes a standard square glass rack. Our Warewash Specialists will provide a complete analysis of your restaurant or deli, and help you decide which dishwasher program is right for you. We have stand alone as well as under the counter models to fit every application. When you join our warewash program, your equipment is maintained by fully trained technicians. 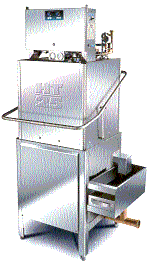 90 second time cycle, perfect for Restaurants, Delicatessens and Fast Food Operations. Call today to arrange for an appointment with our warewash specialist. Operate a free standing, complete warewashing center in only 48" of space by combining one of our under counter models with our stainless steel table package. The dishmachine always receives the exact amount of detergent needed for sparkling dishes, cookware or silverware. 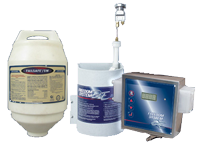 Freedom System granular formulas offer high concentrations of active ingredients and less waste than solids. 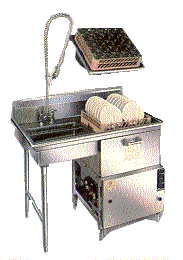 Model HT-25 High Temp Unit Increase your warewashing capacity without expanding your kitchen. The HT-25 washes 35% faster with 33% less chemicals, utilities and water. Copyright 2014 Thomas O. Miller & Company, Inc. All rights reserved.